The focus on this project was to to compose a music to "furnish" a famous speech. 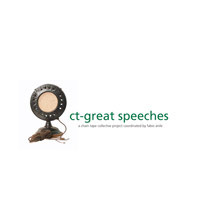 A "great speech" is a speech that has a relevant historical, religious, political, artistic or social content. The goal is to realize a music encyclopedia of some important events. A speech by Winston Churchill, 1940. I added looped guitar, plus a field recording of skylarks, in a tribute to the "nightingales and bombers" classic. Possibly my favourite piece from an excellent collection. The music captures both the sombreness of war and the spirit of hope, and the selection and cutting of the speech, with some repeating of key phrases, makes the whole piece gell. The archetypical English summer sound of skylarks is a masterly final touch. Very moving. The famous speech to the Nation of Benito Mussolini for the entrance in war of Italy. I adore the song by Mr Farinella!Congratulations to Mr Anile for the idea and the theme of the album. Such bittersweet flavour to the music, an excellent counterpoint to the charisma of the speaker and fervent support of the crowds, tempered by our knowledge in hindsight of the devastating consequences. Beautifully understated melodrama. And very nice to hear a non-English speech included! John F. Kennedy, 1961: "I believe that this nation should commit itself to achieving the goal, before this decade is out, of landing a man on the moon and returning him safely to the earth"
Brilliant selection of partial quotes to construct a conversation between US Presidents that I'm sure they never intended! All very neatly stitched together by the unobtrusive music. Fabio I absolutely love the MLK track, great and moving work. I am a member of CT but have never been involved in a project, I hope to in 07.